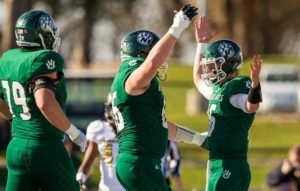 Northwest Missouri State quickly jumped out to a 17-0 lead over Emporia State in the first quarter on their way to a 44-13 victory in the second round of the NCAA Division II playoffs on Saturday afternoon in Maryville, Mo. The Bearcats won their 27th straight and advance to next Saturday’s game against Harding University. After a three and out to start the game, Northwest got the ball at the 39 and needed just six plays to cover 61 yards. They scored on a 6-yard shuttle pass from Zimmerman to Shane Williams. The Hornets fumbled the ball on thier next possession and it was recovered by the Bearcats at the 18. Three plays later, a 1-yard run by Zimmerman gave Northwest a 14-0 lead with 6:57 left in the first quarter. The Bearcats tacked on a 38-yard field goal by Simon Mathiesen with 56 seconds left in the first quarter for a commanding 17-0 lead. A trick play led to a 52-yard touchdown for Emporia State, but Northwest answered in just 1:13 to go 75 yards to increase their lead to 24-6. With 18 seconds left in the half, Northwest added another touchdown on a 1-yard run by Zimmerman to make it 31-6.